The origin of new species from the existing one is called Speciation. It occurs when a group within a species migrates to a new area with different environmental conditions and develops its own unique features. Speciation has taken place over the course of evolution and may have played an important role in driving biodiversity on planet Earth. 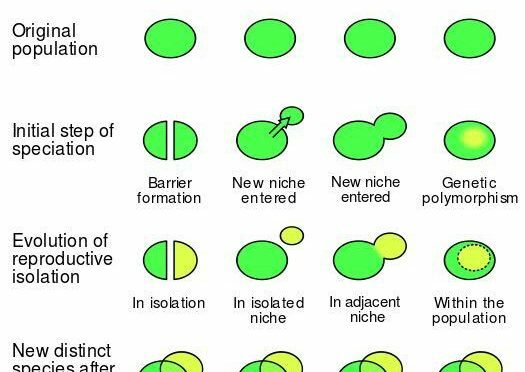 There are four types of speciation in nature, based on the extent of their isolation from one another: Allopatric, Peripatric, Parapatric, and Sympatric. There is also a fifth type i.e. Artificial Speciation, achieved by the influence of humans. The formation of new species due to geographic isolation is termed allopatric speciation. That means, it occurs when two groups of a species are separated by a physical barrier, such as a mountain range, a sea or a river, which makes it impossible for them to breed with one another. Hence, each species develops differently based on the demands of their environmental conditions. These differences are then passed on to future generations and a new species is born. An example of allopatric speciation is the Galápagos finch. Different species of these birds live on different islands in the Galápagos archipelago, located in the Pacific Ocean off South America. The finches are isolated from one another by the ocean. Over millions of years, each species of finch developed a unique beak that is especially adapted to the kinds of food it eats. Some finches have large, blunt beaks, some have long, thin beaks and some of them have medium-size beaks. This is because they are isolated, thus birds don’t breed with one another and have therefore developed into new species with distinctive features. There are four types of speciation in nature: Allopatric, Peripatric, Parapatric, and Sympatric. Sympatric speciation occurs when two closely related groups of organisms inhabit the same region but cannot interbreed successfully. That means, it occurs when there are no physical barriers preventing any members of a species from mating with another, and all members are in close proximity to one another. A possible example of sympatric speciation is the apple maggot (Rhagoletis pomonella), a parasitic insect that laid its eggs in the fruit of wild hawthorns (Crataegus). But, when domesticated apples (Malus domestica) were introduced to North America in the 19th century, a small of maggot selected apples for laying their eggs. The original hawthorn species still only lays its eggs in hawthorns. The two types of maggots are not different species yet, but eventually, they may give rise to new species. 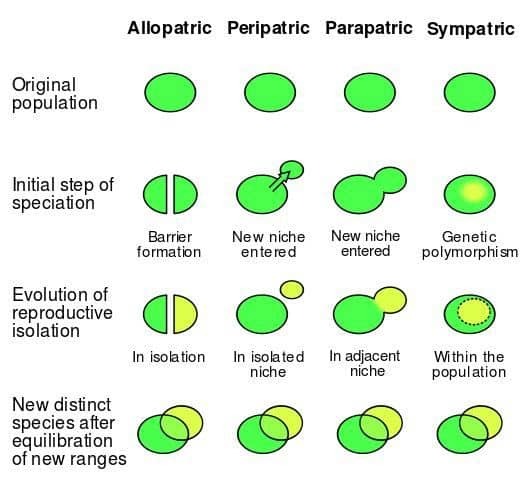 A peripatric speciation is a form of allopatric speciation. It occurs when small groups of individuals separate from the larger group and form a new species. Physical barriers in peripatric speciation are similar to that of allopatric. However, the only difference between them is that in peripatric speciation, one group is much smaller than the other. Within the small groups, organisms which are able to survive within the new environment may carry genes that were rare within the main population and cause a slight variation to behavior or morphology of those species. These characteristics of these organisms are then passed on to future generations of the group, making those traits more common among that group and distinguishing it from the others. Parapatric speciation is an extremely rare case of speciation that occurs when a species is spread out over a large geographic area without any barrier between them. Although it is possible for any member of the species to mate with another member, individuals only mate with those in their own geographic region. Like allopatric and peripatric speciation, different habitats influence the development of different species in parapatric speciation. Instead of being separated by a physical barrier, the species are separated by differences in the same environment. Artificial speciation is the creation of new species by people. This is achieved by separating populations and thereby preventing them from breeding, or by intentionally breeding individuals with desired morphological or genotypic traits, humans can create new, distinct species. Most of the modern domesticated animals and plants have undergone artificial selection. Previous PostWhat are Swim Bladders?Next PostWhat is Plant Tissue Culture?